The BMW M4 is certainly capable on the track. It certainly performs at the track. But it’s not entirely built specifically for the track. The BMW Concept M4 GTS, as BMW calls it, or the BMW M4 GTS Concept, as those who prefer a more grammatically correct nomenclature refer to it, is supposed to be that no-speed-limit superstar. Of course, those of us who aren’t just sticklers for the joys of grammar, but also for the joys of the proverbial writing on the wall would see that this is really the BMW M4 GTS “Concept,” as it looks pretty damn near production-ready. In fact, BMW’s already saying that the “Concept” showcases technologies that will debut on a production model. 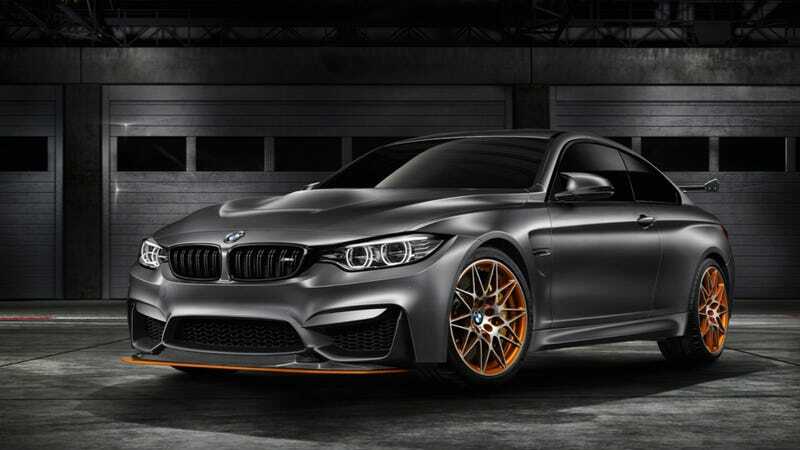 With my immense powers of prediction that should only be used for good and NEVER EVIL, I foresee that what you’re looking at will eventually be called the BMW M4 GTS. No “concept” at all. There’s a whole bunch of lightweight goodies, too, starting with a carbon fiber hood, a carbon fiber splitter, and oh my god did you see that fat carbon fiber wing????? Oh, and there’s something about OLED taillights too, but until we see them in action I’m not sure anybody’s going to be going goo-goo over some taillights. But in the grand tradition of the BMW M3 Evo, BMW M3 CSL, and the BMW M3 CRT, expect to see it on the track pretty soon.